There are external 8 digital inputs on JP5. A voltage of >7V is interpreted as a logical 1 (high). They all have a cutoff frequency of 40Hz. Motor Protection switch (Pin 11). Of course you can use this input for any other fault condition, e.g. the error signal of a 3rd party gate driver. 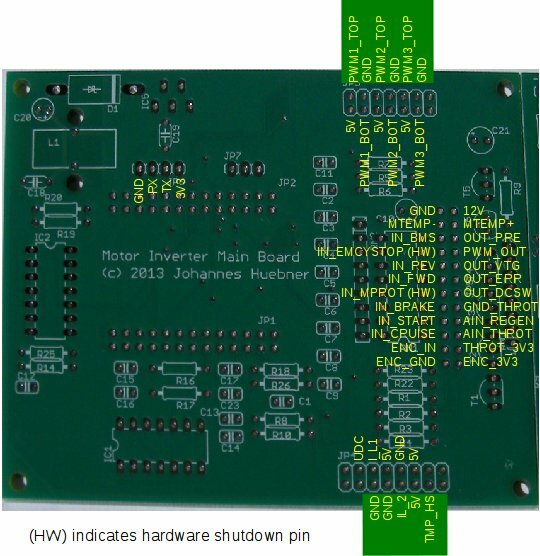 This input has the same function as the motor protection input. It can be used for an emergency stop button. Tie it high otherwise. There are 4 external open collector outputs on JP5. They sink up to 2A. There is one external PWM output on JP5, Pin 18. It outputs a duty cycle that is proportional to the motor temperature. Its offset and gain is software configurable. The frequency is fixed to 17kHz. It is an open collector output so it can be used with most temperature gauges in cars. It can sink up to 100mA. There are 3 external analog inputs on JP5. The reference voltages are provided as well (Pin 4) so the inputs are connected to sensors or pots directly. Cutoff frequency 16Hz, input resistance 47k. There are 4 internal analog inputs on JP4. Pins 5,7 and 10 provide a GND connection, Pin 8,11 and 12 provide stablelized 5V. There is an input for a pulse encoder on JP5. Pin 3 can be connected to an open collector output of an encoder. Its input resistance is 500 Ohms. The cutoff frequency is 6kHz. E.g. a 60 pulses/rotation encoder can spin up to 6000 rpm before the limit is hit. By changing the value of R3 the cutoff frequency can be varied (lower value, higher frequency). Pin 2 provides 3.3V with an output resistance of 75 Ohms to power the diode of an optical encoder with 30mA. JP6 provides a TTL level (3.3V) UART interface. It can be directly connected to the provided TTLUSB adapter. Pin 1 provides the 3.3V net of the Olimex board. 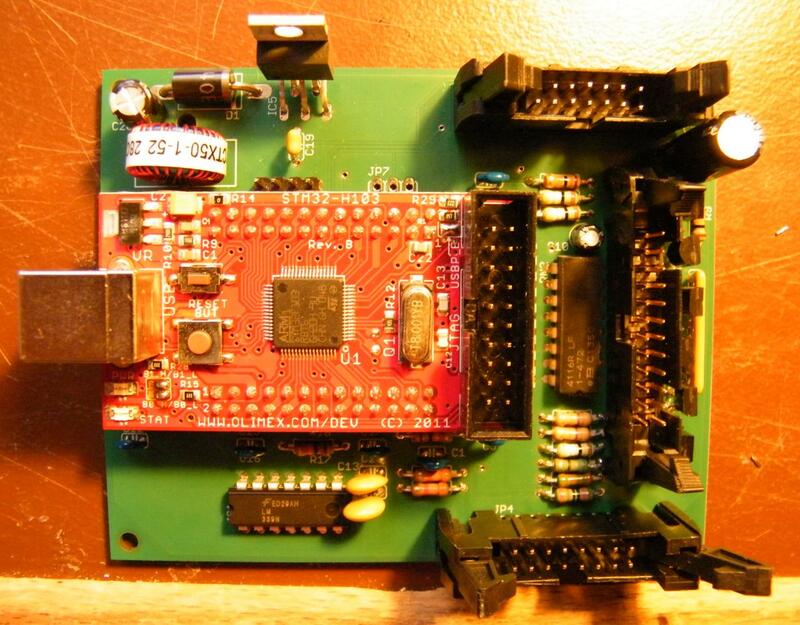 It can be used to power the board or to power an external module like a ZigBee transceiver. 100mA should not be exceeded. Pin 2 is TX, Pin 3 is RX and Pin 4 (next to the inductor) is GND. The communication parameters are fixed to 115200 8N2 (2 stop bits! ).